Fancy Treehouse. : The blues are still blue. The blues are still blue. I call this my "Patriot Dress" because, well, it reminds me of the movie "The Patriot". I love it so much that I will continue to find reasons to wear it even though it's completely and utterly OTT. And just in case it wasn't completely OTT, I went and added a feather "headband". It's such a pretty feather that I violently ripped off of a lavender hat I got the other day. My spontaneous rip left a small hole in the lovely hat but when you are too excited at the idea of putting a feather on your head the simple task of finding a pair of scissors seems far too complicated! Also, Birdie was due for some girlie time since she's just been playing with dogs in the mud lately. She got a bath and a pretty polka dot dress with a Peter Pan collar. Once I added the belt and saw how her feet are crossed in the second picture I almost died from her cuteness. After I took it off she found it in my closet and almost broke the belt chewing it up. She can only be girlie for about 5 minutes a day. :) It's hard to believe how much we love this little gal! And for the record, she likes dressing up because she gets treats. Ooh, I love the colour combination of the pale dress and the jewel tights. Plus the feather of course :) And Birdie looks so adorable in her dress! I LOVE your dress and what a cute, cute dog!! That has to be the most glorious dress I've EVER laid eyes on. I gasped out loud when I saw it! So pretty. And I love how you've styled it with the loafers. Absolutely perfect in every way!! those tights are pretty fantastic. ha is the dog wearing one of your tops? you're just so amazingly cute- you have such doll like features, in a good way. and i always find myself being incredibly inspired by your styling. I about fell of my chair laughing at the picture of your dog's dress. You are too cute. I think my giant pit bull pups would have a conniption fit if I put them in polka dots. I love your headband! It goes perfectly with your bangs. And your pup is terrific! I have a pomeranian, but I've always wanted a Boston Terrier. the pics of Birdie are so cute, love crossed legs, adorable! This is BY FAR my fave look! It is so fabulous. Love the puppy too! this is gorgeous! it reminds me of something that marie antionette might wear to bed. You are so beautiful! That coat was made for that blue dress. This is SO gorgeous! That dress is perfect, and I love how you paired it with the feather to solidify the colonial-ness of it :) And Birdie is just too sweet! Love this, u are darrrlinggg ... and your pup is so freakin' adorable. ahhhh O-T-T, Shmoe-T-T ...i like it! and I hope you wore it in public!! PS. saw your comment on my "tattoo tuesday" post ...i totally can't imagine you with tattoos Coury X-)...therefore yes, they would need to be temporary tattoos! The top verges on costume and that is just what I love. Tops that look victorian, or skirts that look Russian, etc. And then you had to post adorabls cute pix of your pup, as well! just gorgeous!!!!!!!!!!!! love everything about it :) the dress is so pretty and i love that you wore cinnamon colored tights with it. unexpected but super awesome. ohmygosh, that DRESS. it's beautiful! seriously... swooooon. and i love the feather in your hair. everything about this outfit is GOOD. Haha! That dress is amazing - I especially love the lace-up detail at the back. That coat is also a little bit "Patriot" too. And your tights are the perfect color brown! I have been looking for tights that color. ...and SQUEEE DOGGGIE!! her little feet and that little dress - it really is all dangerously cute. The crossed paws are too adorable to handle! This is probably the most magnificent dress I've ever seen! You look so beautiful as always. Such a unique dress! omg. birdie is too cute!!!! haha love the photos with Birdie! But I think you shouldn't dress your dog up if she doesn't like it, anyways it made for a good laugh! 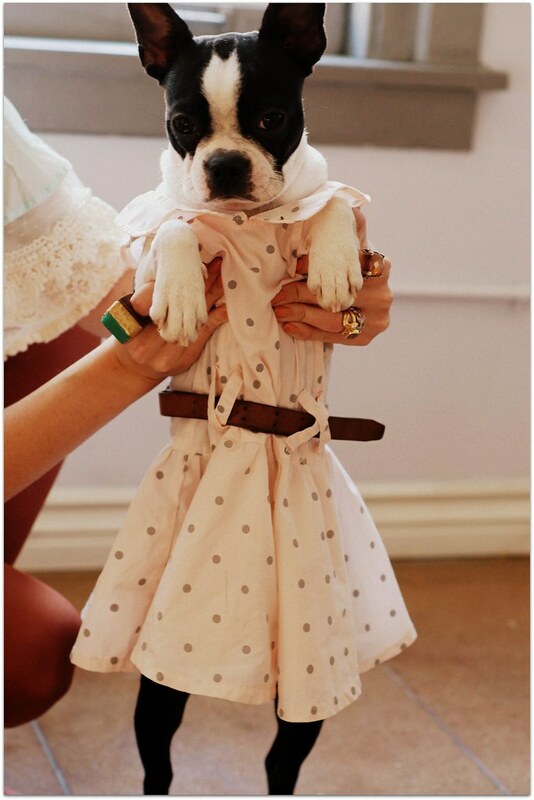 Your dog is so cute with this dress... I have to try this with my cat... not sure it will work with her! I wondering if you sell your pink shoes with the little pompom? Because I dream of those every night!!! PLEAAAAAASE!! so so so lovely. i love your turqoise ring as well, gorgeous dress my dear! that dress. my. god. it's amazing. i don't think there's any proper word to describe it's fantasticness. i know what i want for my birthday!!! Your clothes are so cool!!! I adore your dress! 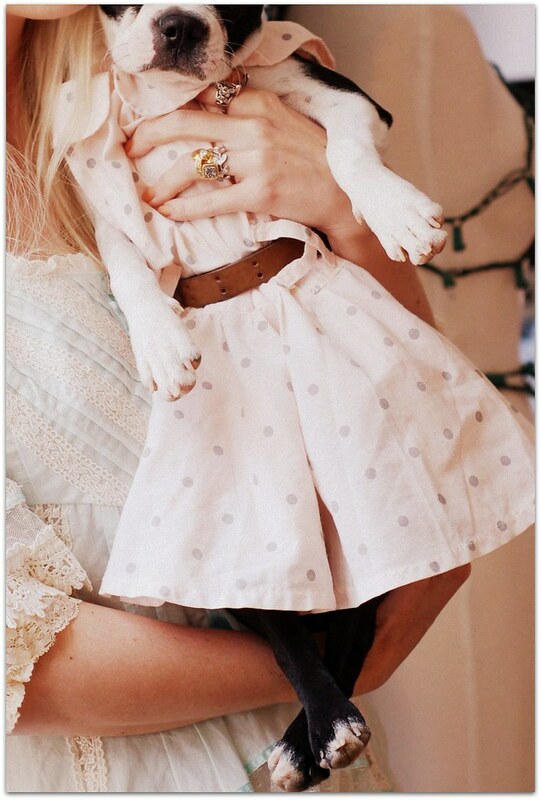 your pups dress is adorable :) it made my night. lovely pictures, lovely dress! perfect! 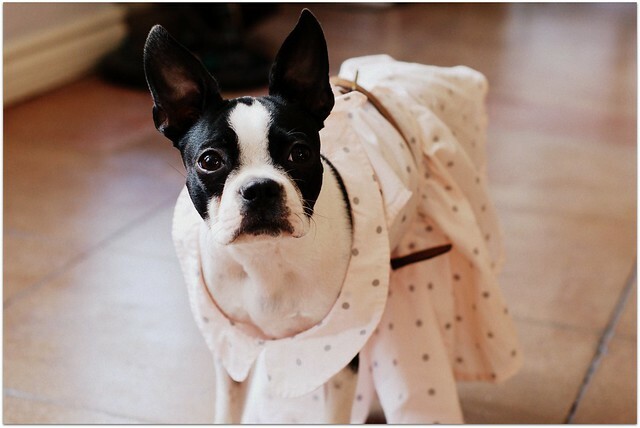 oh goodness I guess if I had a cute Boston Terrier, I'd want to dress it up too. how sweet. I love the corset back on your outfit. what a beautiful dress! And I love the lace!! OMG these photos are amazing! I kept thinking....is this in a magazine? the dress is great! i just love it with the red tights! Love your jewellery and clutch !! oh my goodness!!! how precious!!! And adorable pictures of your little dog! Seriously so cute! wow!! what a great dress!! Aww the two of you are just so adorable! Really lovely! your outfit is beautiful~! you are beautiful! your dog is beautiful! im lovin it all! You look like a princess! Love your outfit! coury, this is one of my favorites of yours! beautiful! I Love the lacy dress, especially under the trench, the way the sleeves poke out with a hint of frilly awesomeness. Also? You may have the cutest pup ever. I love the dress with the feather, but try pairing the dress with the hat you wore to disneyland! ohhh Birdie looks so cute haha! 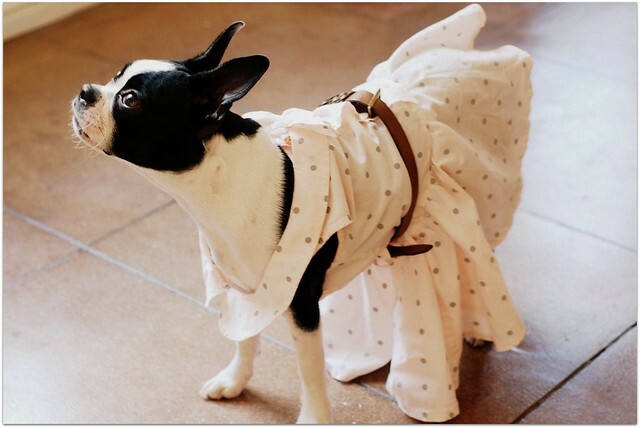 Your dog is really cute in this dress, so funny ! The dress turned me crazy !! Goshhhh it's exactly my dream dress !! Where did you get it PLIIIIIZZZZZ ? oh your blush, your hair, your style! you're gorgeous! so glad i found your blog! hahahaha then end of this post made me laugh! LOVE the sweet look you're rockin! COURY! I love this dress and your dog. and your blog (it's my new favie, how have I lived this long without it?)! Love these <a href="http://www.loudstarbazaar.com/shop/brand-starlyte-ethos/starlyte-ethos-agile-shimmer-capris/p_84.html>Sheer tops</a>! Great paired with a tight black or blue jean!